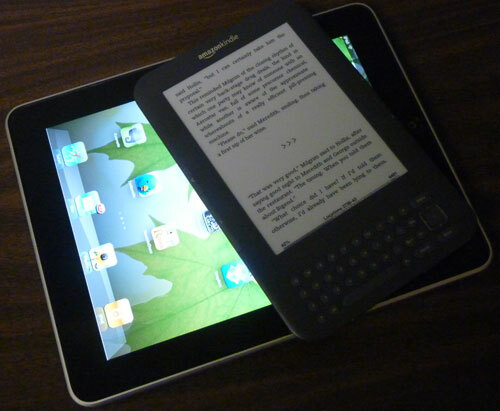 Should I buy a Kindle or iPad? My first response to this question is what else do you want to do with your purchase. If all you want is an elegant reading solution, buy a Kindle end of story. If you have designs on doing anything other than reading with your new gadget purchase, we need to dig a little deeper before I can make a recommendation. Comparing an iPad and Kindle doesn’t really make sense because the iPad is a multifunction computing device and the Kindle is an ebook reader. With an iPad, you can download apps that do everything from edit photos, to remotely access your computer, to play games, to write blog posts. With a Kindle you can read and while it also supports playing back audiobooks, the Kindle is really just a reader. If you truly only care about reading text, get a Kindle. The screen is more versatile because it’s just as easy to read in full sun as it is to read under artificial light. The iPad fails the sun test because all you will see on the screen is your reflection. The Kindle is lighter to hold, which means you won’t get fatigued as quickly while holding it. Sure the iPad has a variety of kickstand cases that can prop it up, but those aren’t very handy if you’re the kind of reader who can’t put down a good book while standing in line. The Kindle is far more portable than an iPad. I can put the Kindle in the pocket of my cargo pants, which also means it fits nicely in most women’s handbags too. An iPad is simply too big to be highly portable without a bag designed to carry it. When I’m traveling light, the Kindle wins for reading. A better question is whether you should buy books from iBooks or the Kindle App if you buy an iPad. The answer to that question is much easier – buy from the Kindle store. The books will work on Windows, Mac, iPhone, iPad, Kindle hardware, Blackberry and Android phones. If you buy an iBook, as of this writing it will only work on an iPhone or iPad. Maybe that will change, but it doesn’t seem likely.